Prior to 2011, crude oil shipping was almost nonexistent in New York. Since then—with little public input and no comprehensive study of risks—the state has become part of a virtual pipeline. Now, billions of gallons of explosive crude “flow” each year from the Bakken oil fields of North Dakota to the Port of Albany, and from there via train, barge or ship down the Hudson Valley. Proposed expansions of oil terminals in Albany could further increase this volume by up to 1.8 billion gallons annually, while also enabling shipments of heavy tar sands crude oil—almost impossible to clean up if spilled. As crude oil production has increased, train derailments and barge and tanker accidents throughout North America have caused dozens of deaths as well as millions of dollars in economic and environmental damage. The danger the Hudson Valley faces from the transport of crude oil and other hazardous materials has been underscored by the recent near miss accidents in Newburgh (March 7, 2017) and Haverstraw (April 12, 2017). In Newburgh a CSX train carrying sulfuric acid and other hazardous materials derailed within the immediate vicinity of Global Companies' oil terminal. In Haverstraw a CSX train hit a car-carrying trailer in Rockland County. Although accidents happen, we may not be so lucky nexy time. In order to safeguard Hudson Valley Residents we need safer regulations for the trasnportation of crude oil and other hazardous materials. 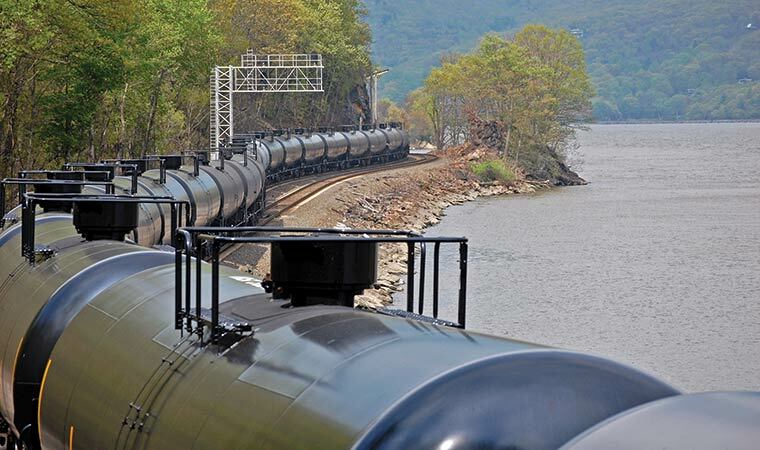 Scenic Hudson submitted comments to the Federal Pipeline and Hazardous Materials Safety Administration (PHMSA) urging the agency to establish volatility standards for crue oil and other flammable materials carried on trains. 25-35 trains travel down the Hudson Valley every week, some carrying 100 or more tanker cars (with a capacity of up to 30,000 gallons in each car). Three-fourths of the fleet carrying Bakken crude are class DOT-111 railcars—“bomb trains” without basic protective features such as pressurized tanks and puncture-proof hulls—ill-equipped to carry explosive materials safely. Check out the New York Times Op-Doc “A Danger on the Rails,” featuring Scenic Hudson President Ned Sullivan, to learn more about the risks posed by shipping crude oil by rail. One barge carrying 4 million gallons of crude oil departs from the Port of Albany each day. Approximately once a week, the tanker Afrodite departs Albany carrying 8 million gallons. Emergency-response plans are inadequate to handle a “worst-case” spill. Transporting large volumes of crude oil by barge, train and pipeline poses great risk to the Hudson Valley’s inspiring beauty and natural resources. While crude oil spills from pipelines happen less frequently than from railcars, they often release far more oil per incident and spill more oil per ton-mile traveled than barge or rail. Pipelines are inadequately monitored—the federal agency responsible for pipeline safety has only 135 inspectors to oversee 2.6 million miles of pipeline—and high-profile pipeline accidents in recent years (like those in Kalamazoo and Santa Barbara) demonstrate that modern construction and technology don’t eliminate the risk of serious spills. Pilgrim Transportation of New York, Inc., has proposed two side-by-side pipelines to carry large volumes of Bakken crude and refined petroleum products through the Hudson Valley, from the Port of Albany to New Jersey. The Pilgrim Pipelines would be 170 miles long, running along the Thruway for part of its route, with the remainder snaking through private and public land and beneath the Hudson River. This project presents unacceptable risks to invaluable resources and almost no economic benefits to Hudson Valley residents. The pipelines would impact 11 of Scenic Hudson’s protected properties, 19 public parks, the Hudson River and dozens of its tributaries the drinking water supply of several million people and nearly 150 acres of forest. Preventing Global Partners from expanding crude oil operations in New Windsor and receiving, storing or transloading Bakken or tar sands crude at its massive Albany terminal. Appealing provisions in the U.S. Department of Transportation’s crude oil-by-rail rule that allow dangerous “bomb trains” to remain on the rails and keep emergency responders in the dark about risks their communities face from crude oil transport. Working with the U.S. Coast Guard to update the Area Contingency Plan for emergency responders and advocating for the inclusion of information about train routes and threats to prepare for oil spills and disasters. Educating and activating the public and elected officials. Ask your state Senator and Assemblymember to co-sponsor bills (S.1515 and A.1773, respectively) that will require that railroads transporting highly volatile Bakken crude oil to demonstrate that they carry sufficient insurance to cover a worst case scenario spill or explosion. Write Gov. Cuomo, state and federal elected representatives: Demand appropriate financial surety be required when shipping volatile materials by rail. Write the NYS Department of Environmental Conservation: Require full environmental impact reviews of pending permits for oil terminal expansions at the Port of Albany.